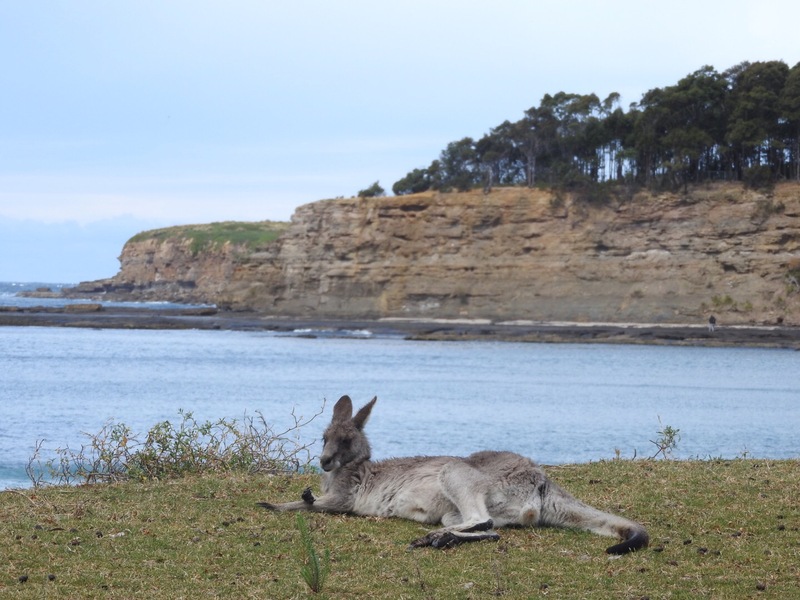 As we set off from Ulladulla, our favourite spot so far, we planned to knock out a few kangaroo-on-the-beach hotspots and stay in the national park. On our way, we swung into Bawley Point to have a quick peek. It would seem that one lookout turns a little into the next (“What was there again?”) but of course, it’s beautiful none the less. Lib was extremely excited as we turned into the Murramarang National Park; her expectations high even as we bounced along the dirt road. 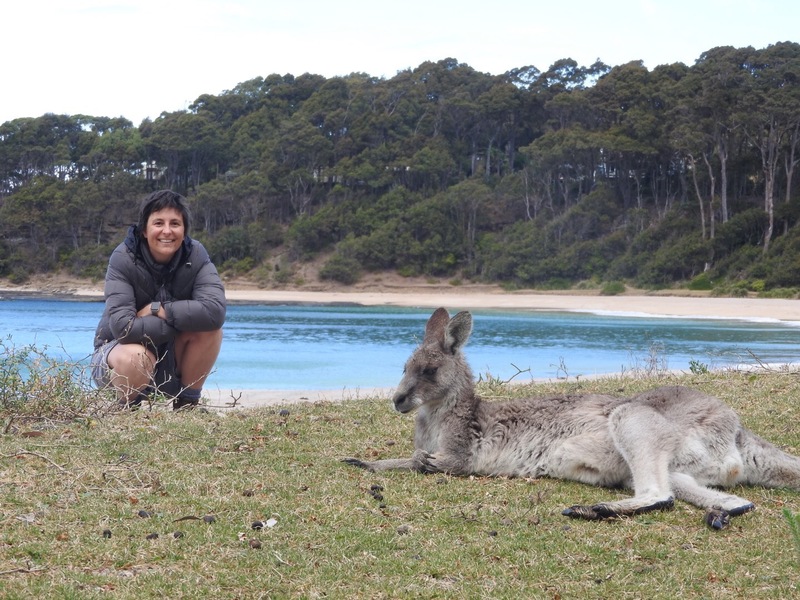 Our first stop was Pretty Beach: infamous for kangaroos on the beach. 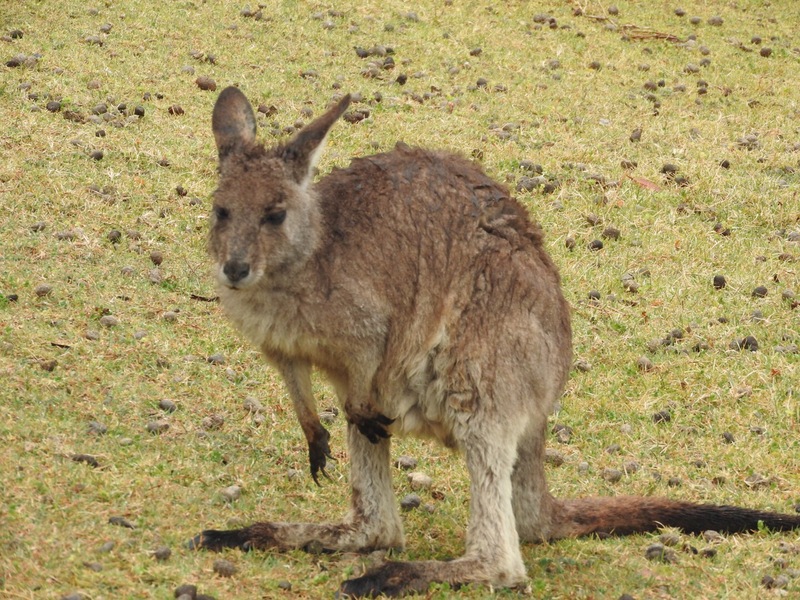 As we drove in, it was around 10am, and we knew in our heads that most roos were tucked away at this time. There is a beautiful picnic area opening that overlooks Pretty Beach, and it does look like quite a pretty campground as well. Just up to the left from the Pretty Beach carpark, we decided to do a quick 350m walk to a lookout. It felt like the longest 350m, up a steep but manageable descent. As we reached the top, the cliff-face stood stark against the bush background and turquoise waters. 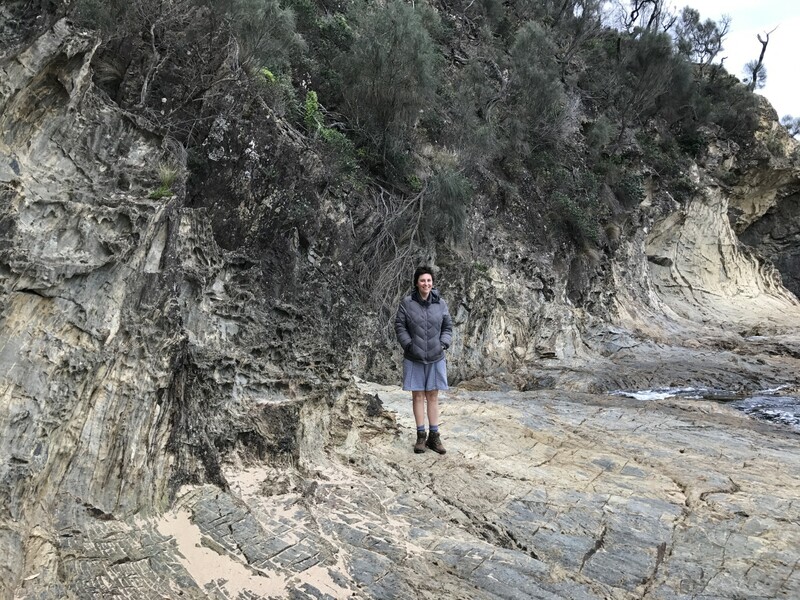 Directly below the lookout, there looked to be giant fossils on top of the rock platform – it’s hard to see the scale in the photo, but each line was around 1m long. On the horizon there were dark storm clouds brewing, and the chill factor suddenly increased tenfold. We sped down the track, shivering as we got to the car, waiting for the rain to hit. 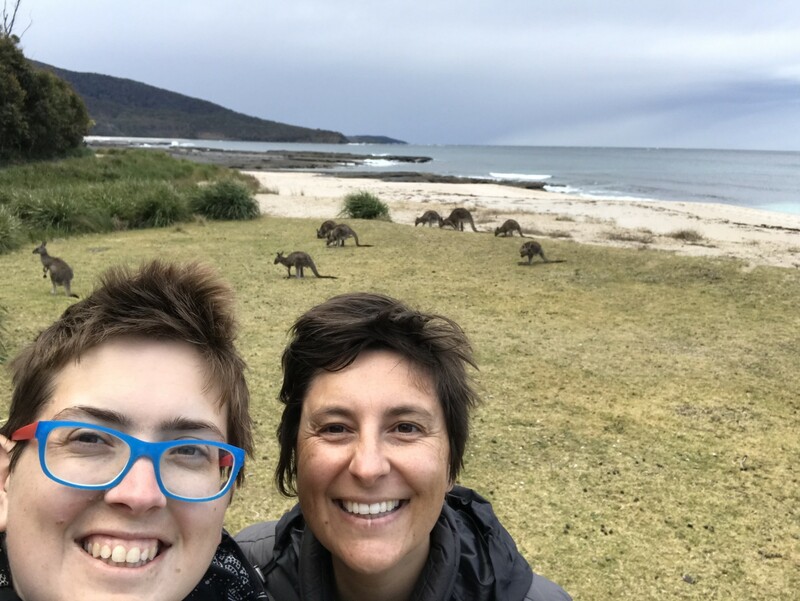 Oh – and we were yet to see any kangaroos at all. We decided to push on despite the weather, and headed to Pebbly Beach. 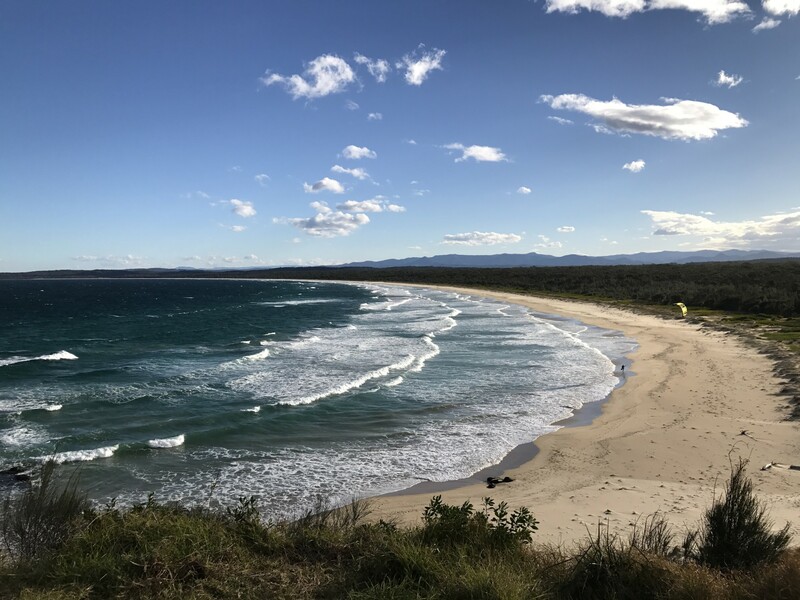 Following a sign just out of Pretty Beach, we hung a left and headed into nearly a 4WD road – unsealed, uneven and with the bush leaning inwards towards us. Of course at this point it started to rain. We had no service, so we crawled along this road, hoping that at some point we’d reach the beach. Knowing it was at least half an hour away, our adventurous spirits were slightly dampened. Lib focused on the road, and I focused on hoping we got out the other side. Of course, this was really just a regular National Parks type road, and it’s not a 4WD track; our little experience shone through. About 20 minutes in, we had a blip of service, and I saw we could take another windy road out to the highway and then loop back in to Pebbly Beach. We both exclaimed gleefully after 10 mins more, when we popped out onto real road again. We arrived at Pebbly Beach in a tiny downpour. We looked expectantly around for roos… I’m sure they were all sensibly seeking shelter at this point. We donned our duck-down jackets and headed down to the beach. 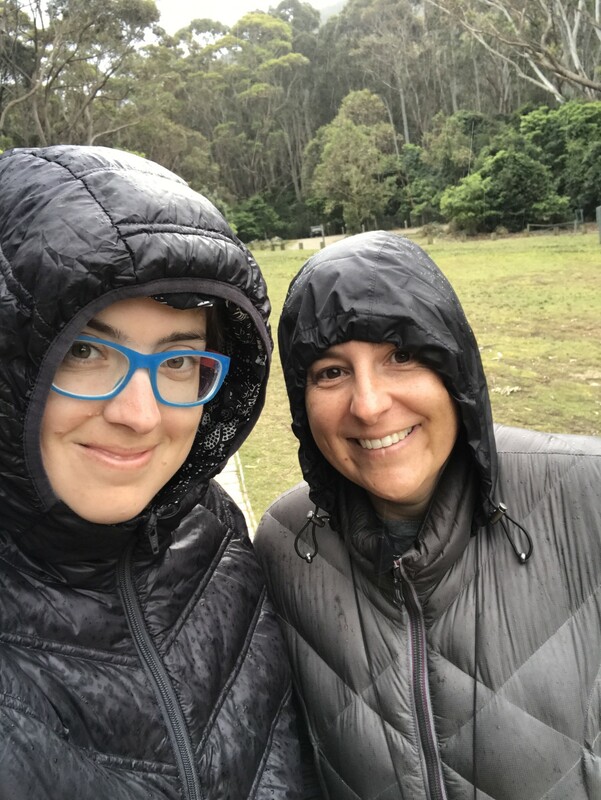 On our way, we passed a troop of young preteen boys, around thirty of them, equipped with proper hiking gear and little blue rain capes. Some faces shined with adventurous spirit and you could tell they were having time of their lives. As we passed the back of the pack, the faces were admirably stagnant – their worst fears seemed to have come to life as they trudged over the same damp ground as their peers. “It’ll blow over soon” their troop leader said to us as we G’dayed. I am sure he meant the weather, but I felt for these young folk. In many ways, they were indeed having an amazing experience yet I remember being unwilling to appreciate or adventure in school. As though being forced to have a great time was too much. I am sure the boys will look back on this trip with a great deal of difference when reminiscing. We headed out to our third beach – Depot Beach – and our possible camp for the night (weather and camp vibe pending). Depot Beach appeared to be largely a cliffy area where the beach was separated from us by a line of bush. We drove down a windy road and found ourselves looking out over a beautiful (overcast) beach. 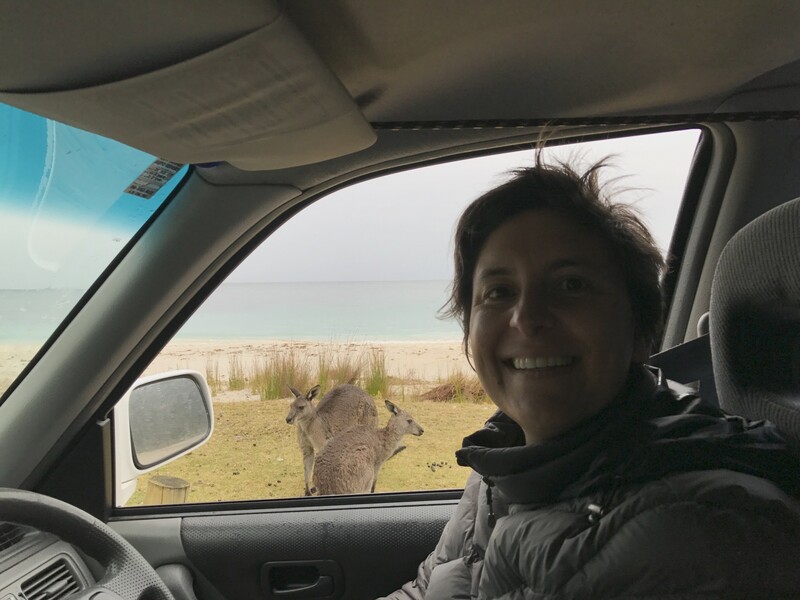 As we drove along to see where the road would take us, suddenly a movement caught our eye … it was a kangaroo … right at the beach edge!! Lib stopped the car and I climbed out to get a snap before we bothered them. Turns out, there were not bothered by us at all. We got out and explored the exposed rock platforms that cover the north side of Depot Beach. A few splashes and a fin highlighted a dolphin playing just off the rock edge. 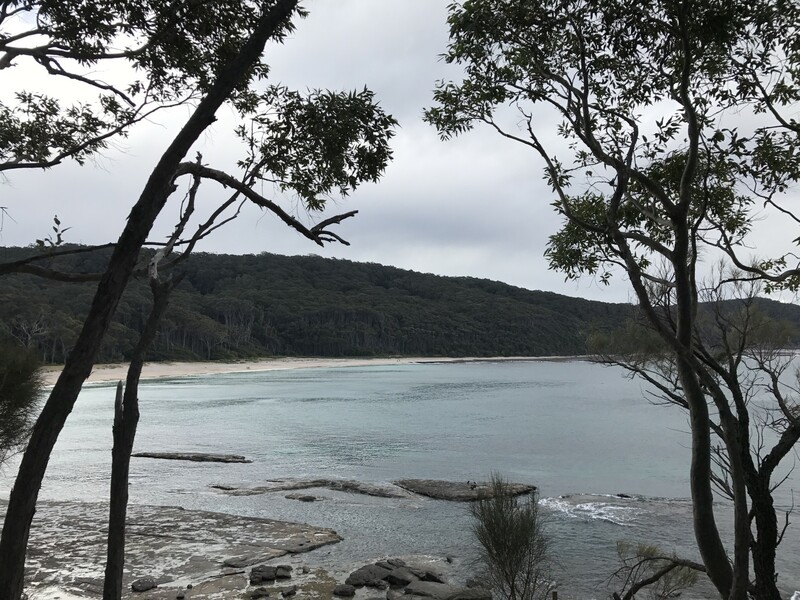 Looking back at the bush, with the gum trees coming right to the beach, I found I was again reflective about the scale of our country. We drove into the National Parks campground to have a look at the site, with the possibility of camping. It was a very pretty site, with central toilets and quite a few campers, but the weather was still overcast. We got out to use the loo before we moved on – only to find the loos were closed for cleaning. At this time a ranger walked past and explained we can’t use the amenities if we aren’t staying. So we quickly got back in the car, to find it wouldn’t start. Well – the key wouldn’t turn over – the steering wheel lock had engaged. So now, after being chastised, we were immobile… and busting! We pulled out the Honda CRV manual and I read about the steering wheel lock. 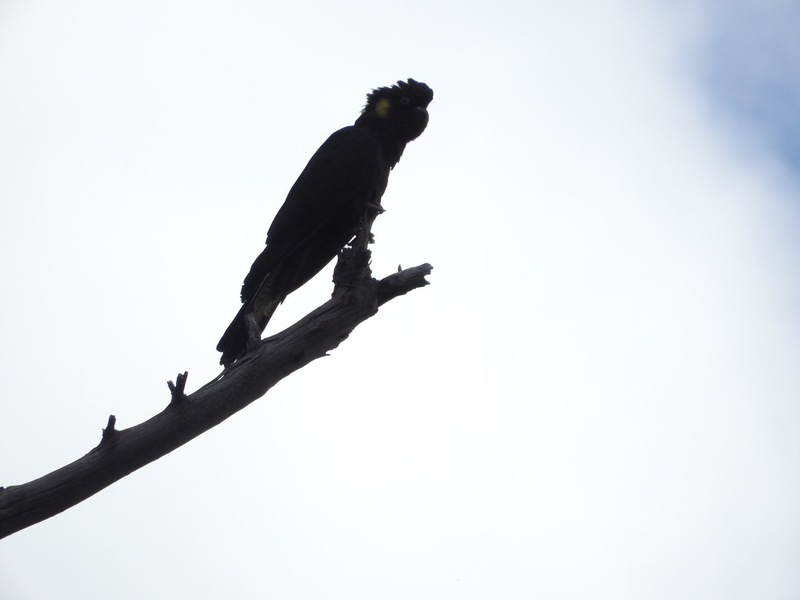 Whilst standing outside, I heard the distinctive cry of two black cockatoos and searched the sky for their call. 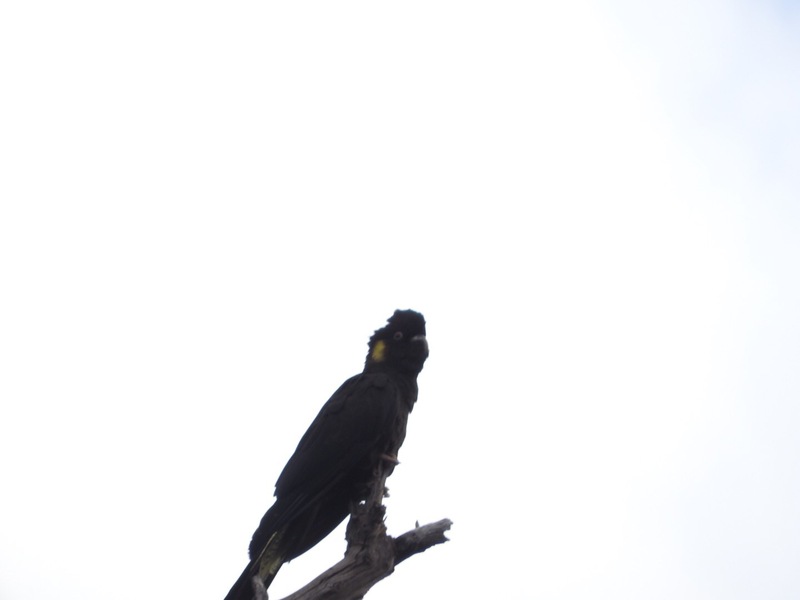 Sure enough, perched right at the edge of my Nikon zoom was a beautiful black cockatoo, his mate circling the tree tops. It was hard to get a clear photo, but these two were massive! After reading the car manual, I decided to try giving the car a little push (whilst in neutral) at the same time Lib turned the wheel to release the lock. Sure enough (and thanks to the small incline we were on), with the front wheels shifted, we were again able to start the car. Phew! We hurried our way to the next bush toilet spot. Oh yes, we also stopped at a lookout just above Depot Beach and lost our respective minds thinking we saw a penguin. 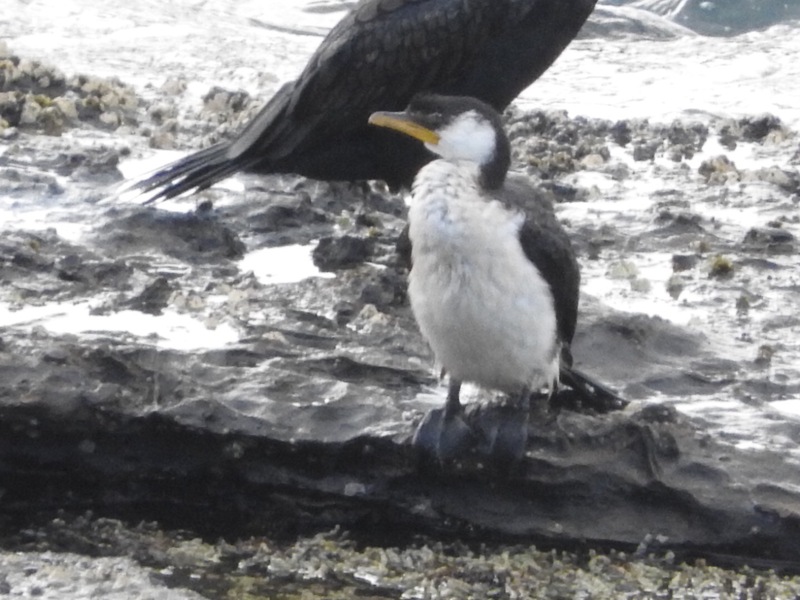 Upon closer inspection, it was just a shag. 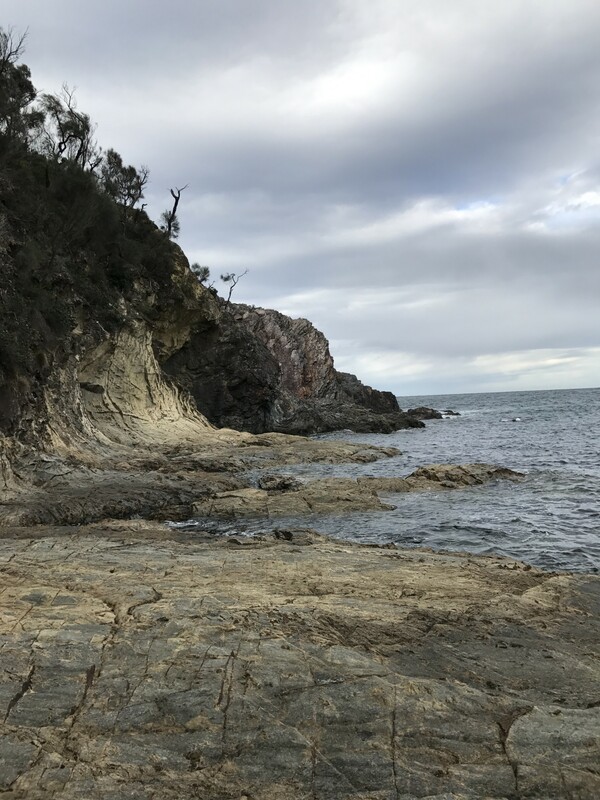 Depot Beach, despite being overcast and refusing our loo patronage, was a beautiful place – one of many unusual and stark environments on the South Coast. Yet now, without somewhere to stay and with hungry stomachs, we moved on. 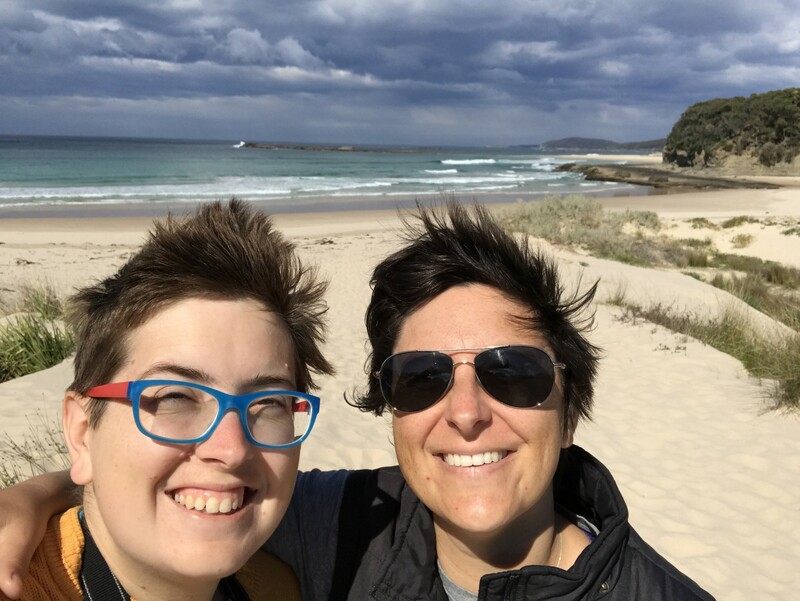 After a fortuitous random stop in search of a weather sheltered picnic area (where in literally the few minutes we were there, a large pod of dolphins swam past), we ended up at Guerilla Bay. 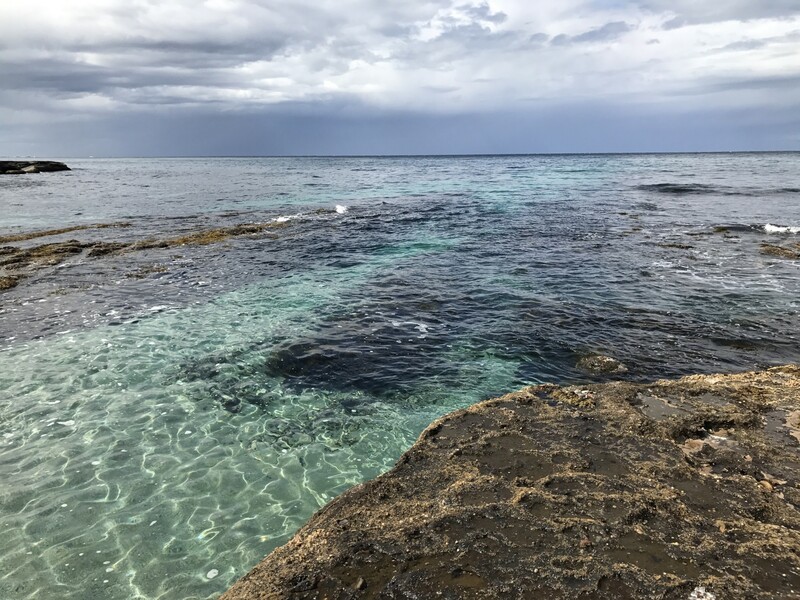 This beautiful little hideaway bay is sheltered by large rock formations and looks like a beautiful place for a swim (and is a popular snorkelling / diving spot). 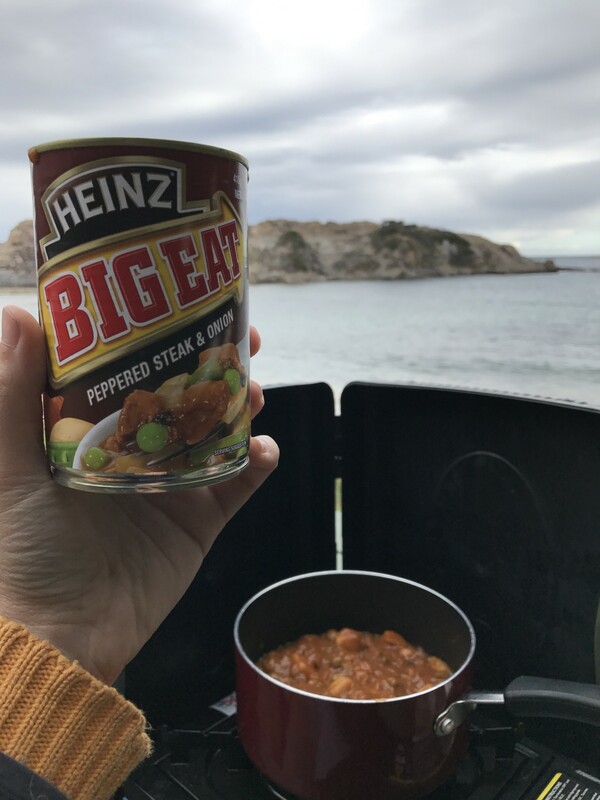 We quickly cooked up some steak and onion stew, before sitting in the car sheltered from the wind and weather to eat. 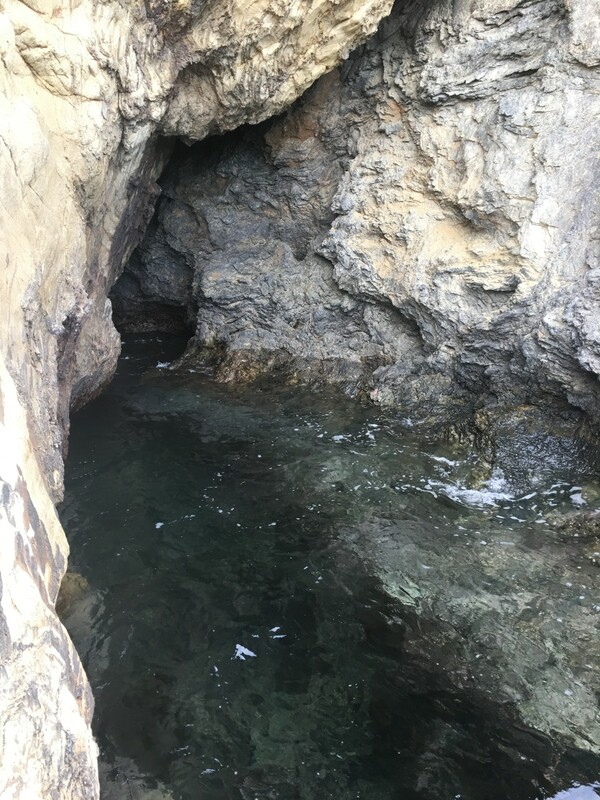 After our lunch we did a quick explore of the north side of bay, with Lib jumping over rock gaps to see inside pirate-like caves. Check out the scale of these rocks by zooming in to find me in the last few photos!! 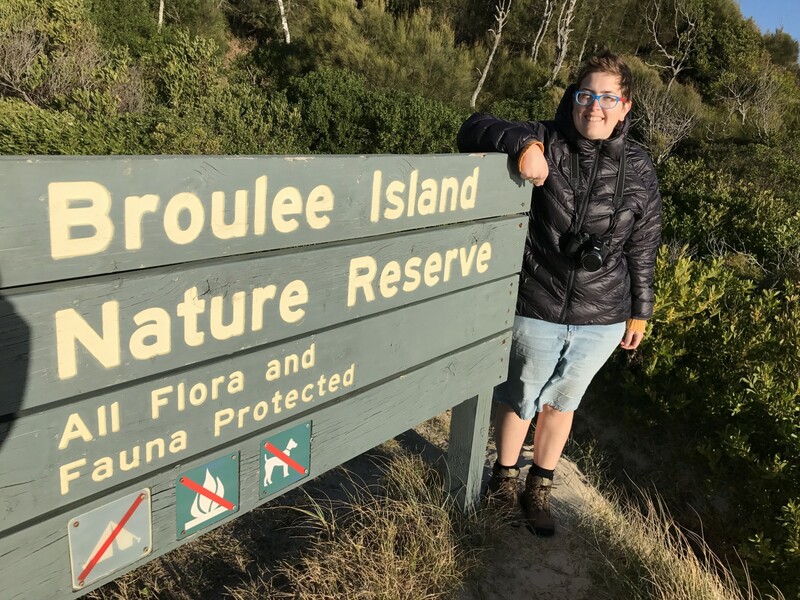 Our next stop was Broulee Island Nature Reserve. Lib had read that it was a great walk, with the chance to see seals, whales, fairy penguins and sea eagles. It turned out to be a difficult walk to find. 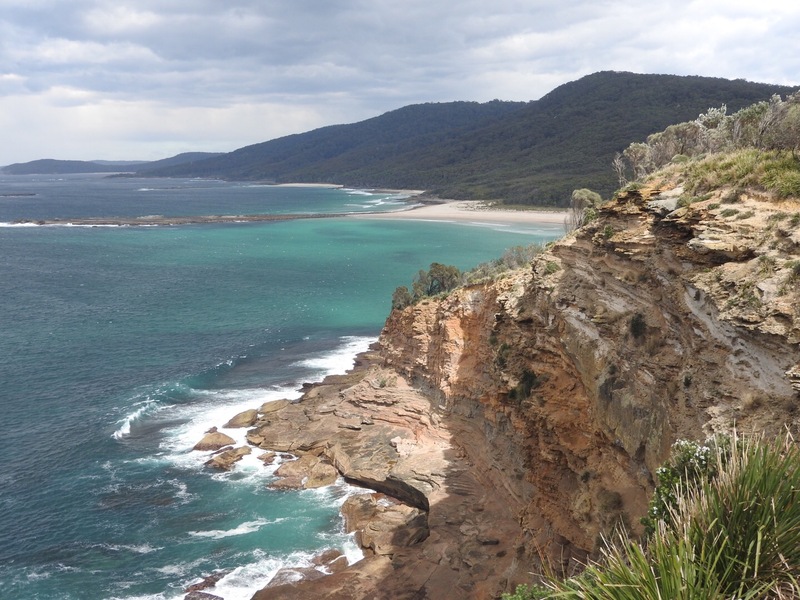 After checking out a lookout at the top of Broulee, we drove down to the opposite beachside. 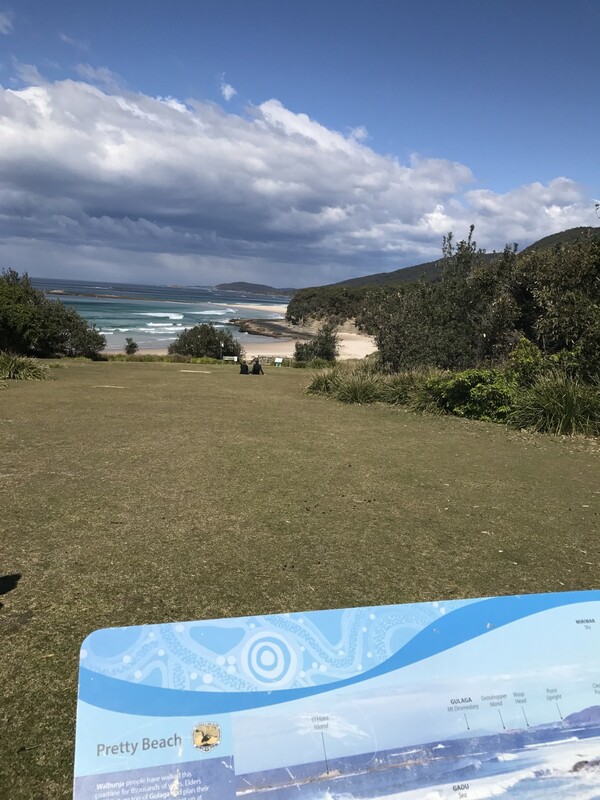 We parked at the end of Harbour Drive and found ourselves walking down a developed track towards the bay and island, passing a non-helpful sign highlighting general coastal information. 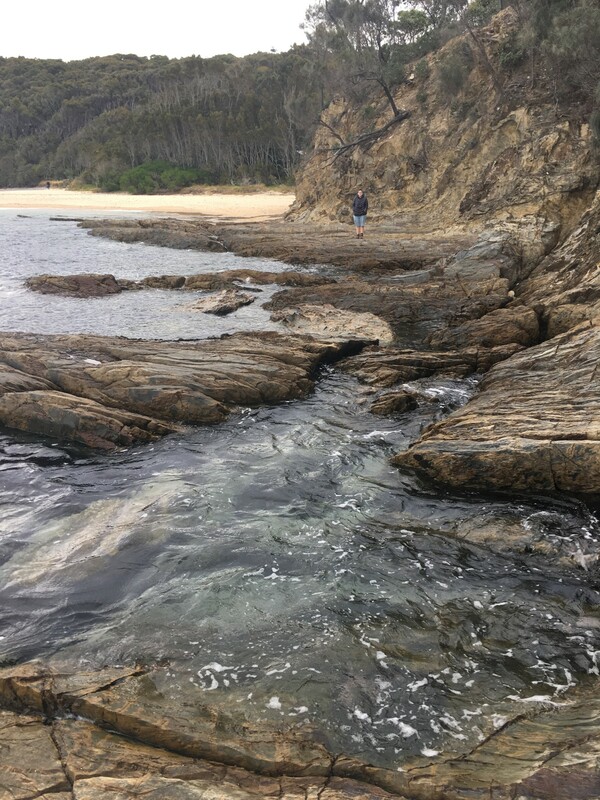 As we broke through this first bush walk, we saw a beautiful open bay beach. The sun had come back out and there was a bit of wind, pushing the waves into the sand. We saw some people ahead break into the bush track near a sign, so we headed towards them. 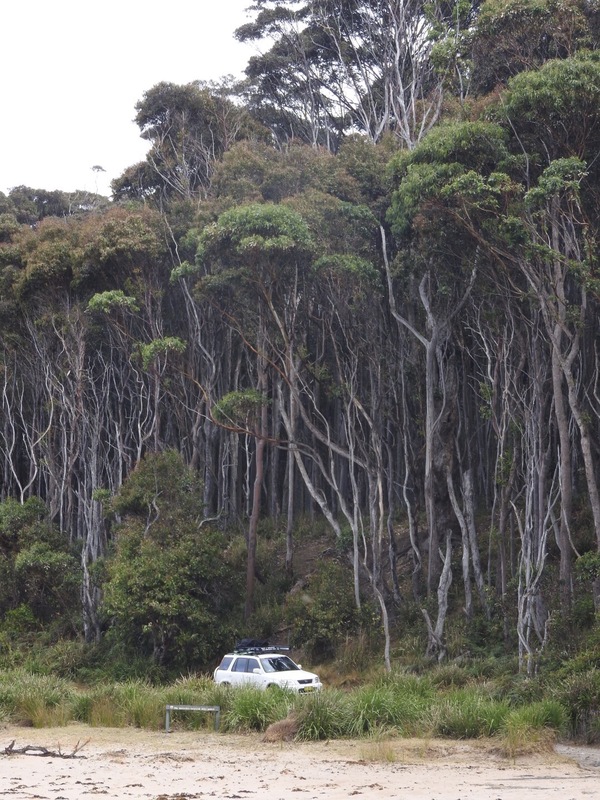 Climbing up a steep entry, a small bush track appeared and we followed it deep into the Broulee Island bush. Keeping our eyes peeled for wildlife, our legs were scratched by overgrown foliage. 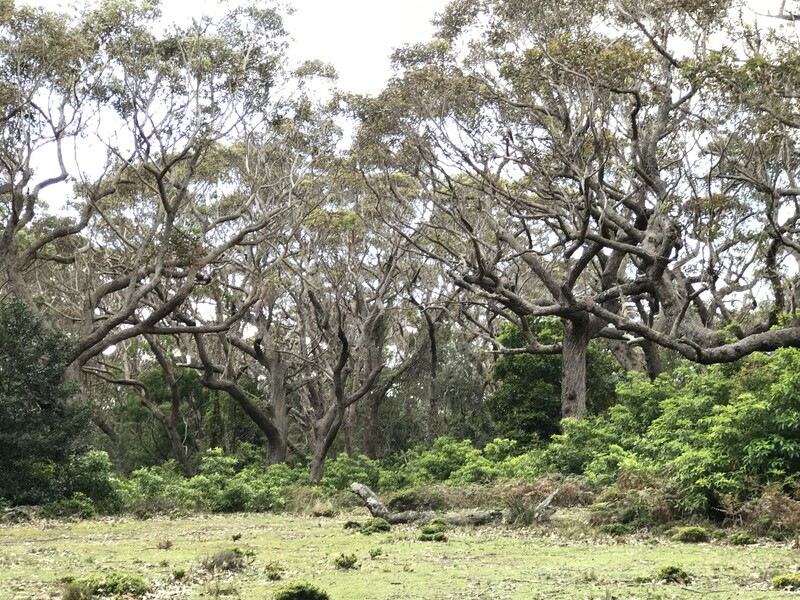 Lib commented that it was impressive to see a walk left so natural – clearly it was not a maintained way to keep nature intact. As we got deeper in, there were some branches over the track and at parts it seemed near impossible to pass through. We were wondering if we were even on the right track, when we broke through to the other side of the sand bank and saw another beach bay. Yet when we walked the length of this beach, with the intention to round Broulee Island, there was no path back into the bush. Perhaps we took a wrong turn. We looped back and headed onto our tiny track, to see if there were any points to turn. No… before we realised, we were back near the original sand bar beach. Confused, we saw a rocky bank go around the south side. We started now walking this way, thinking at last we had found the true trail, not really acknowledging that we had basically just bushwhacked for 35 mins. 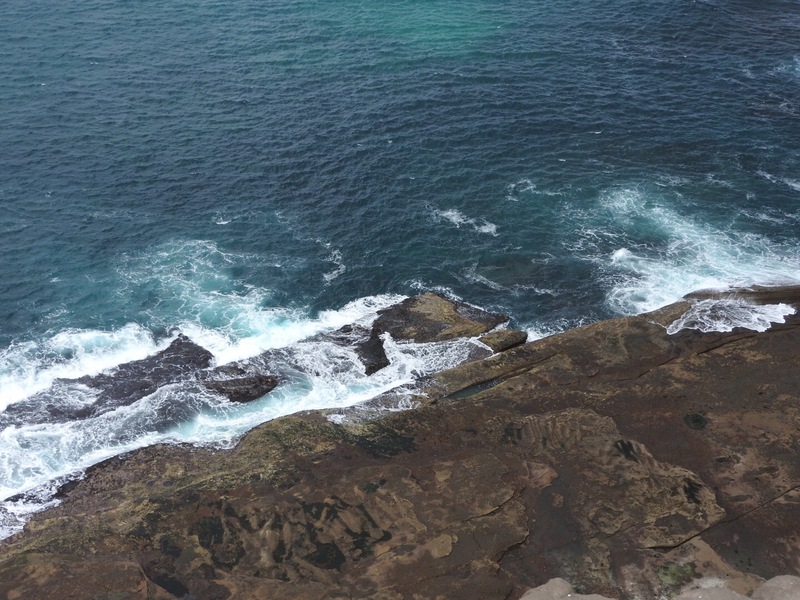 As we walked around the rocky cove, the waves encroached closer and closer on our path. After around 15 minutes, it became clear it was not a safe route to continue, with the swell easily knocking us into the ocean if we persisted. 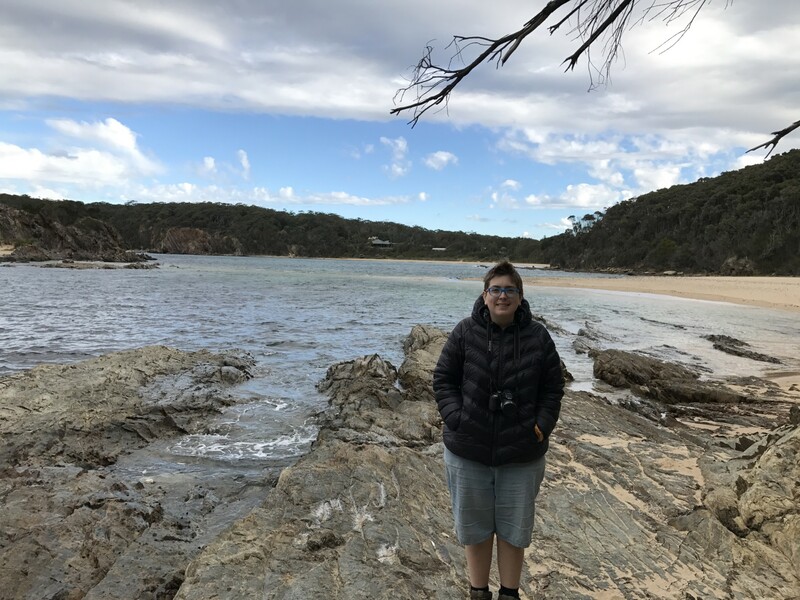 Although we glimpsed a large white bellied sea eagle, we were both disappointed we couldn’t find, let alone complete, the Broulee Island Nature Reserve “comfortable 4km loop” walk. It was also frustrating that so many tourist websites simply copied and pasted the same paragraph about the walk. No-one could provide clear information or a map, and there were no signs in the area. It would seem (based on what little we could glean from other blogs) that when it is very low tide you can walk around the perimeter at the water’s edge. Well, it wasn’t going to happen on this trip! Tired and deflated, we pushed forward. It was getting dark and we were yet to lock in a campsite for the night. 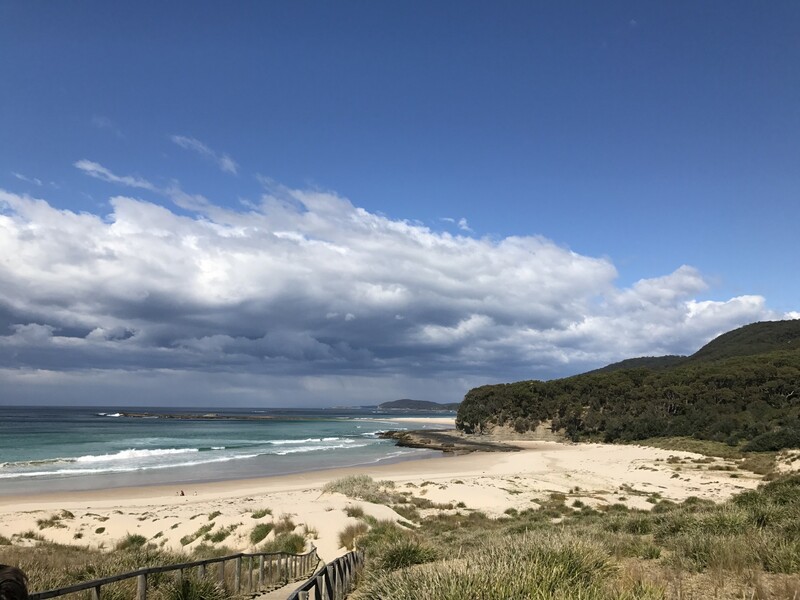 Based on some WikiCamp reviews that mentioned Emu sightings and plenty of kangaroos, we began the slow drive into Eurobodalla National Park – to Bushcomber Holiday Park. Keeping a watchful eye on the wallabies trying to cross the road every few metres, we drove the 2km into Potato Point and arrived at the site. 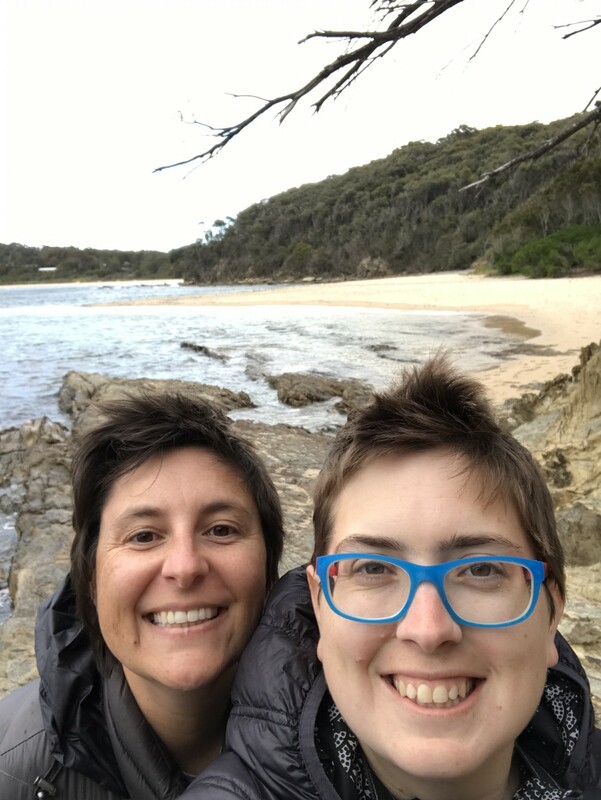 Although closed up for the night, the wonderful Robyn and Robert let us in, welcoming us with such positivity and warmth that we immediately felt we had picked the right site. They offered to sell us firewood for the firepit on our beachfront site, and we accepted. The owner even assisted us by showing us to our site (it was very dark!) and carrying our wood. We setup quickly, and lit the fire. Huddled here by the fire, we both felt such peace. 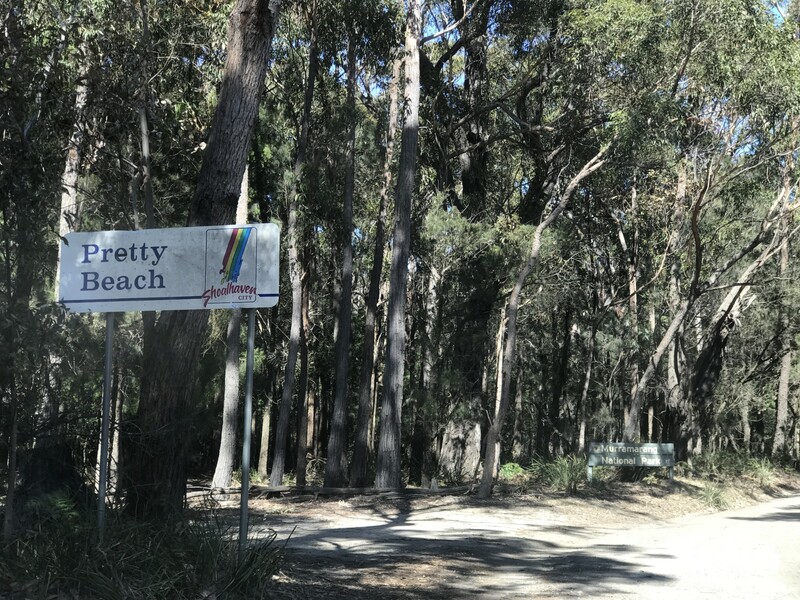 The starry sky above us, the sound of the ocean in front of us, and the occasional visit from a bandicoot, Beachcomber Holiday Park was already becoming one of our favourite stops.